Interested in becoming a Referee? New Richmond is hosting a clinic April 7th! Click picture to register. New referees start the certification process by visiting www.minnesotasrc.com. ***other locations and dates available on the website above. Parents - consider refereeing with your children. It is a great way to make some money, demonstrate work ethic and spend time with your children. 70% of our referee pool is under the age of 14! The community could use your leadership. Looking to Become a Referee for the First Time? We are certainly excited about your interest in becoming a soccer official! People from all walks of life officiate soccer, and have varied interests form helping out the local youth leagues to working competitive matches to even one day working professional matches or the World Cup! The Minnesota State Referee Committee provides training for all levels of soccer officiating and interest. Account creation for new referees is only open during the month of July (for our summer sessions) and then late October through late May (for spring sessions). We do not permit account creation at other times of the year to eliminate the possibility of people paying registration fees when they cannot be used for training. 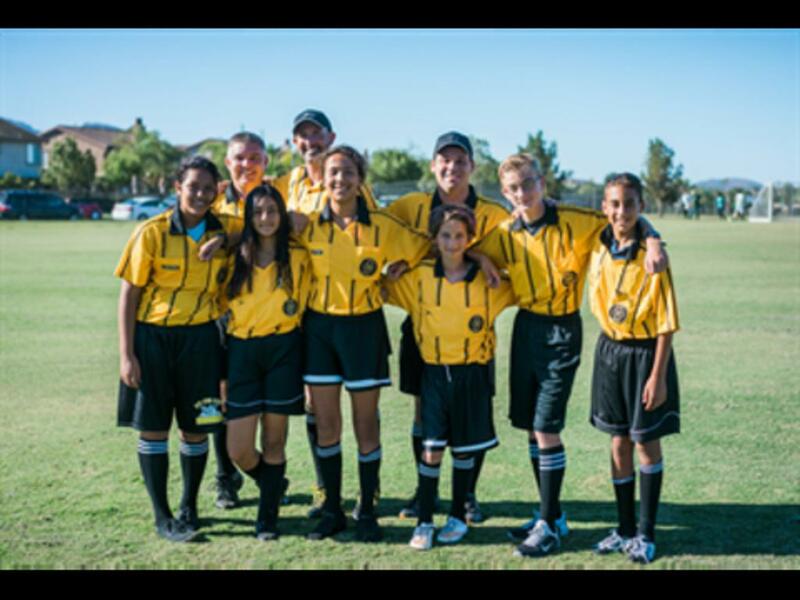 If you are a parent of a child that is looking to become a referee, we urge your to watch our Parenting a Referee video so you can learn about the benefits, expectations, and challenges facing your child in becoming a referee! As a new referee, you will have certain requirements that you need to complete to be able to take the field for the first time. These requirements are covered in a short video that you are required to watch before submitting any kind of payment, to ensure that you have a complete and thorough understanding of both these expectations and our policies. This summary page will discuss some of these tasks, but the best way to know exactly what you need to complete is to create an account (there is no charge for this) and then log in. New referees must start the registration process by first creating an account on this website. If you haven't done so, please navigate to the "Create Account" page and set up your account. Included in the account creation process is the requirement to select one or more clubs or competitions you plan to work for. When you declare for a club or competition, that club/competition's assignor will then be able to track your progress and have access to your email to send you updates and instructions. Furthermore, you will see the contact's name and email and be able to contact them as well. You can view the training clinic list for the entire state (but not sign up for them... you have a few more steps to complete before you get that far) via a blue button that appears in the right-hand dark blue column. If you view this list while logged in, it will automatically list clinics within 40 miles of your home address at the top. The website only allows progress to each step if you have completed the one before it, and the first step you have to complete after creating your account is paying your 2016 fees. These fees are divided into a non-refundable $20 State Admnistrative fee and a $40 US Soccer Referee registration fee. The MNSRC website accepts payment by credit card only. Once you have paid your registration fees, you will be able to access the "Online Material" page from your Referee menu on the left side of the screen. When you click on that, you will gain access to the full online portion of the training, 20 video modules that take about 6-7 hours to complete. MNSRC, in an attempt to add flexibility to the training process and reduce classroom time, has established online training as part of the educational process. You will have to complete all of the online modules to finish the online training before you are allowed to sign up for a course. Within these modules are quizzes, most of which require a 100% score to pass and move on. While this sounds drastic, the quizzes tell you what you missed and why, and allow you to retake them instantly. After completing all of the online modules, follow the "Clinic Sign-Up" button in your "Referee" menu. This will allow you to sign up for the clinic you want to attend. You must take the entire 8 hour classroom to certify as a Grade 8 referee. In the past we offered a shorter course to certify as Grade 9, but that was discontinued after the 2015 spring season due to severe lack of interest (less than 1.5% of all officials in the state utilized the program, making it an unecessary cost for the SRC to maintain). Grade 8 referees are certified to work any youth match, and if old enough, may run a line as an assistant referee in adult amateur matches. Once you have completed the class and are credited with attendance, you will gain access to the USSF Grade 8 test. This is a final test, 50 questions long, and passing score is a 40 our of 50. You will be given the opportunity to review the test, including an explanation of every question you missed, and then will be permitted to retake the test immediately if need be. Once you pass your test, your account will be certified by the State Referee Administrator and you will be mailed your 2016 USSF badge and Law Book. Please make sure your address is accurate. You will receive only one badge. Additional badges, if you lose yours, are available for $3 via purchase through our website, pending a sufficient supply. If you are 18 years or older, you must complete a background check on the Minnesota Youth Soccer Association websitebefore being able to work youth games. Full instructions for completing the check are available on the MNSRC site. If you will be under 18 years of age for the entire season, you do not need to complete this task.